I mentioned that we recently went on vacation. I did not mention that it was to the Happiest Place on Earth: Walt Disney World. When my husband had a paper accepted at the biggest national conference in pediatrics, and when I found out the conference was in Orlando, we decided to make a family vacation of it and try taking the girls to Disney since kids under 3 get in free. I grew up in Disney World. This is not hyperbole. My parents have an Orlando timeshare, and we went at least once, usually twice a year, from when I was 8 years old. For me, going back to Disney is almost as nostalgic as going to grandmother’s house. It’s a place full of happy memories that I know very very well. Because we went so often (it and the Gulf Coast were the only places we ever vacationed), my family did Disney a little differently than families who only ever go once. For us, the pressure was off to see and do EVERYTHING since we knew we’d be back, and because we had a season pass, my parents didn’t hesitate to get us out of there when it was time to go back to the condo and nap. Do not expect to see and do EVERYTHING. 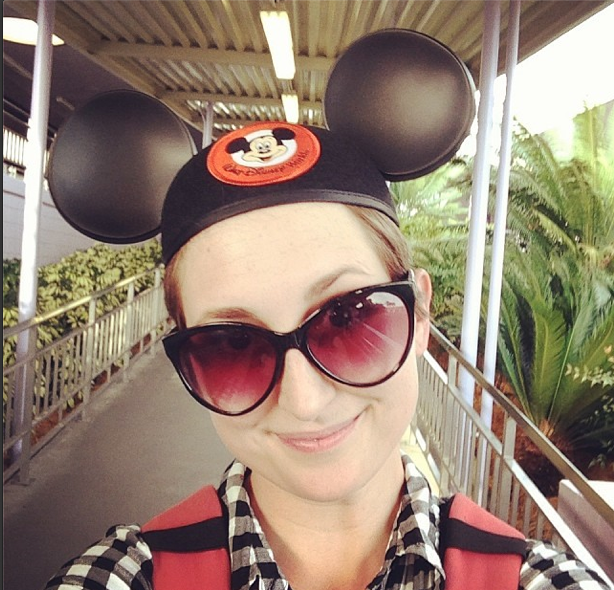 Do not plan to spend a whole day at Disney World with toddlers. 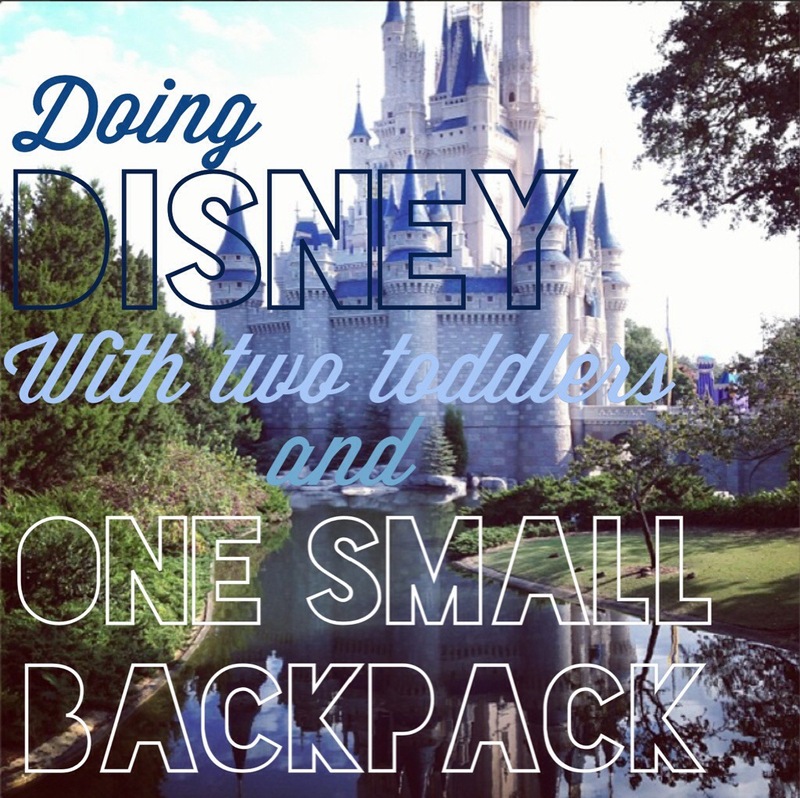 By keeping those things in mind, we were able to truly enjoy our time in the parks with our tiny people. We had a 5 day non-park-hopping pass, which worked out fine. We were generally able to spend about half a day in the parks, and then the girls were done with stimuli, crowds, and the stroller and we had to leave and take naps at the condo. We probably could have come back in the evenings for a couple of hours, but by that point, we were tired too, so we stuck to quiet dinners and early bedtimes (our girls basically stayed on Central Time), and putting our feet up. We did two days at Magic Kingdom, and one day each at Epcot, Hollywood Studios (which will always be MGM to me! ), and Animal Kingdom. One major note: we went in October. The weather was lovely, but warm. We still got sweaty. I would NO WAY, NO HOW take toddlers to a Florida theme park in the summer. It would just be miserable, like pushing a stroller through the most crowded circle of hell. I do not think my sanity could take it. October is better. Nice weather, less crowded, and everything was decorated for Halloween. Also, we took advantage of off-season rates, and used Groupon to secure a two-bedroom condo with kitchen for $400 for the week. Also, the Magic Kingdom on Halloween itself is amazing– everyone we saw was wearing costumes, and some were quite elaborate! I think my favorite was a large family in which grandma was Snow White and every other family member was a dwarf. Speaking of pushing strollers through hell: this is what it would be like if you rented a Disney stroller, no matter what time of year. Those things are terrible, made of hard plastic which can’t be comfy for little bodies, don’t recline, and I saw more than a few tip over backwards in our time at the parks. On top of that, renting a double stroller at Disney is $31 per day. Insanity. Because we were driving there, and because our resort had cribs and high chairs, we had room in our car for our beloved Baby Jogger City Select double stroller. 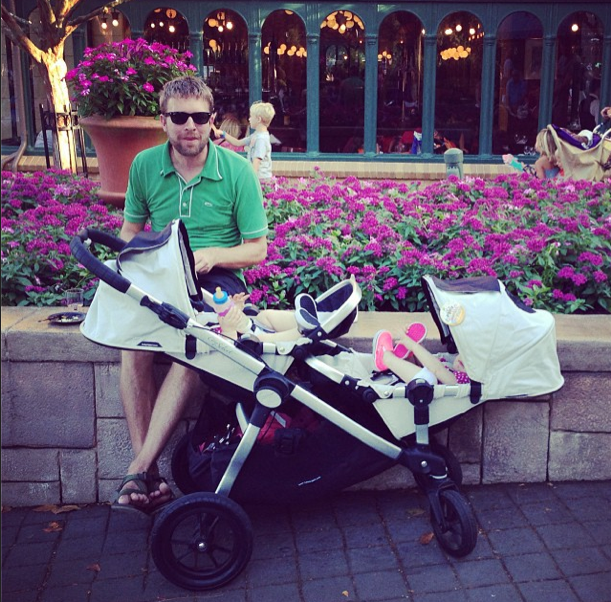 If you are flying, I highly recommend looking into stroller rental in Orlando. I scoped out the names of several of the companies I saw on the Baby Jogger City Mini Doubles being pushed through the park, and it seems $95/week, delivered straight to your hotel, is a standard rate for a high quality double stroller that won’t make you hate yourself as you push it through one of the most crowded places on earth. Our beloved Baby Jogger City Select in nap-mode at EPCOT. Another thing about strollers: unless you pack an umbrella (which I don’t recommend, because you’re going to want a sun canopy, basket, and reclining seats), plan on doing a smidge of extra walking. Disney parking lots are vast expanses of blacktop ruled over by attendants in yellow stripey uniforms, often on segways. You will park where they say to park. You will walk to the front of the cars. You will stand behind the yellow line. You will wait for the tram. You will disassemble your stroller and all the stuff you planned to stash in the basket to flatten it all and fit it into the tram while somehow holding on to your two small children. You will say “screw the tram” and leave your kids in their stroller with all their stuff stowed below as you elect to walk yourself to the Transportation and Ticket Center, which really isn’t as far as it seems. Related: when going to the Magic Kingdom, Thou Shalt Ride the Monorail rather than be packed like an Ellis Island Immigrant onto the slow-moving cruise across Bay Lake on the Ferry Boat. Thou shalt arrive in half the time. Admittedly, it had been a long time since I went to Disney with/as a small child, and I really wasn’t sure how much my kids would get out of it. A lot, it turns out. There’s plenty of stuff for little kids to ride (my kids are 18 months), and if you know what they can handle, the day will go quite smoothly. I know my kids well enough to know they can’t sit through any stage shows, stunt shows, fireworks shows, or parades. They also have no idea who most of the characters are, and will not get enough out of meeting any of them to justify standing in line for a photo op and autograph, so we skipped all the character meet and greets. They do however, love rides. In the Magic Kingdom alone, they rode and loved: Aladdin’s Magic Carpets, The Jungle Cruise, Pirates of the Caribbean, The Carousel, It’s a Small World (their fave), Winnie the Pooh, Voyage of the Little Mermaid, Dumbo, the Teacups, and absolutely could have ridden Peter Pan’s Flight, the Haunted Mansion (little kids don’t know it’s supposed to be scary), and the People Mover and the spaceships in Tomorrowland had we not run out of time. We were selective about which of the no-toddlers-allowed rides we chose to ride ourselves, utilizing Fastpasses or rider swap to get our turns on attractions the girls couldn’t enjoy, though for the most part, we focused on things that we could all do together. 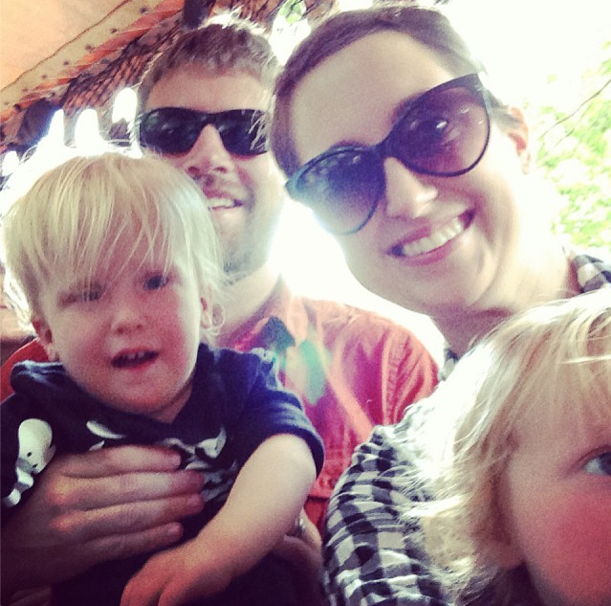 The whole family on The Jungle Cruise. Animal Kingdom was probably the second most fun park for the girls, Epcot third, and we really could have skipped Hollywood Studios entirely. Epcot was super fun for the adults, though, because it was the food and wine festival, and we enjoyed eating our way around the world via reasonably-priced small bites and little glasses of wine. Another good reason to visit in the fall. If I were going in the warm weather, I might have included a swim diaper for each kid (there are some splash fountains at the parks I know they would like). Other than that, we shared food off our plates at lunch, were never in the parks at dinner, and never once needed anything or wished we had brought something else. 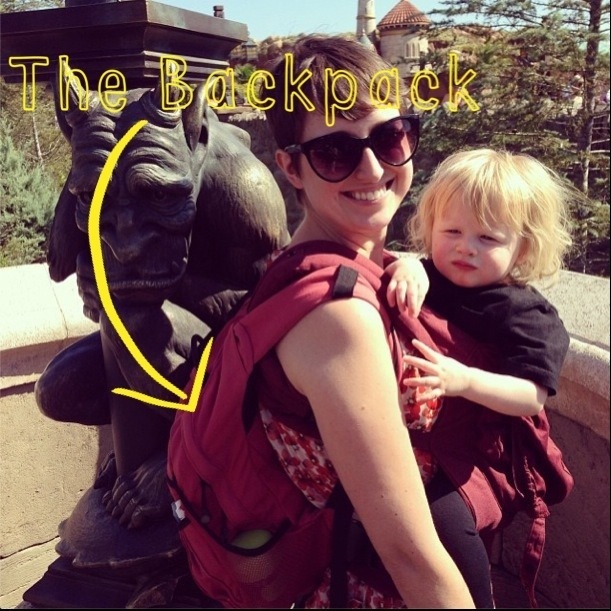 Beyond the contents of the backpack, our other crucial items were an Ergo carrier for each child. What we would do was, navigate the stroller to an area of the park, park the stroller in a designated area, put each kid into an Ergo, and go through lines that way, doing everything in that area before putting them back in the stroller and moving on to the next area of the park. By wearing our kiddos, who are very used to being worn and love it, we weren’t fighting with kids struggling to get down to the ground as we moved through lines, and we weren’t wearing ourselves out holding them. For some rides like It’s A Small World, I even left the kid in the Ergo for the duration of the ride. I cannot stress enough the importance of bringing a carrier that is comfortable for you both if you bring toddlers to Disney. These carriers were stashed under the stroller and easy to get on and off. They were also wearable WITH the backpack full of stuff, so we never had to leave the backpack behind, and because the backpack was small, we could always take it with us, even on the rides. So, there you have it, my guide to Disney with toddlers. Have you ever taken a very small child on such a vacation? Have any tips or questions? It was the ‘one small backpack’ that grabbed all my attention. Cool!